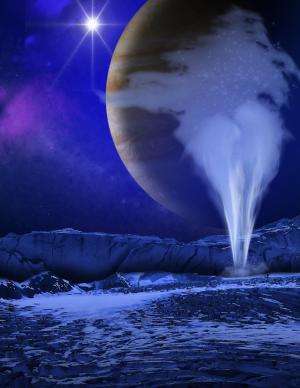 Astrobiologists worldwide received news in December 2013 that water vapor was detected in Hubble Space Telescope observations of Jupiter's moon Europa, which is considered one of the top potential locations in our solar system for life. Those results were published in the journal Science and led by Lorenz Roth, a planetary scientist at Texas' Southwest Research Institute. 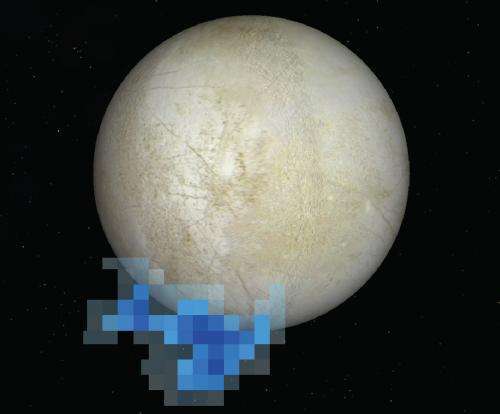 However, follow-up observations of Europa have revealed no plume emanating from the moon. A new paper reveals that Europa's atmosphere is 100 times less abundant than claims in previous publications, and composed mainly of atomic rather than molecular oxygen. Furthermore, the magnetosphere plasma, or superheated gas, at Europa's orbit is very hot, with properties indicating that the plasma is mainly composed of ions, or charged particles, from a nearby moon called Io. Based on the plasma properties, the rate of injection of neutral gas from the surface of Europa is very low. This means the plasma in Europa's atmosphere has a low density, and a low escape rate into its magnetic field or magnetosphere. No one knew what the plasma was made of before Cassini's measurements, which led some researchers previously to believe that the plasma came from Europa. Plasma, superheated gas, can be comprised of different molecules, including hydrogen and oxygen, but Cassini's spectroscope was not designed to measure which species of molecules were present in the gas. Because molecular hydrogen and atomic hydrogen were not found in Cassini's measurement of the plasma, this means that the plasma did not come from Europa as was previously suspected. The plasma that as detected was made of sulfur dioxide – a product of volcanoes on Io. Shemansky has spent most of his life exploring the Solar System through the eyes of various NASA spacecraft, notably including Voyager and Cassini. The lead author and coauthors are team members of the Cassini UVIS experiment. The new data comes from a five-month Cassini flyby of Jupiter in 2000 and 2001. Scientists already knew there was plasma, or superheated gas, in the vicinity of Europa based on data from Voyager's flyby, as well as the long-term Galileo mission, which explored Jupiter and its moons in the 1990s and 2000s. Those instruments, however, couldn't distinguish between different elements in the plasma and, therefore, could not determine the origin of the plasma. That's where Cassini was different. Cassini confirmed a similar concentration of plasma that Voyager and Galileo saw. It further detected a mix of sulfur and oxygen ions that most likely come from Io. The moon's volcanic activity spews these elements into its orbit, creating a plasma "torus" that Europa's orbit also passes through. This would mean that any output that scientists see in the area is from Io, not Europa, which has grim implications for life. Europa would need to have fissures in its surface to allow for contact between its hypothetical underground ocean and the combined effects of the magnetosphere and solar input on its surface. The energy input would include gravitational flexure by Jupiter in addition to the sun and magnetosphere. If the plume is a rare event, this means there are likely few or no cracks in the surface. Europa might be a socked-in icy ball with a barren ocean below. Shemansky emphasizes that he has no reason to doubt the Roth et. al. observations. The spectroscopy they saw, replete with atomic oxygen, was in similar quantities you would expect if water molecules were breaking apart. The water's hydrogen has enough energy to escape into the magnetosphere (the magnetic environment around Europa), while the oxygen remains closer to the surface. But there were three issues with the theory, he said. While he says there is no reason to doubt the observations yet, it is the only direct indication of water ejection from the surface, the observation has not been repeated, and there was nothing unusual detected on the planet's surface at the time of the ejection. Io as a major source of mass and subsequent accumulation of energy in the magnetosphere is a conclusion drawn in the review a decade ago by Christopher Russell, a planetary scientist at the University of California, Los Angeles who examined the role of the volcanic moon's emissions in Jupiter's environment. The work was based in part on Voyager and Galileo observations. He added that the radiation is easy to observe because there is so much energy associated with the Io torus. The energy comes from the rotation of Jupiter's magnetic field, which whips around quickly because the gas giant rotates with a 10 hour period. Europa's plume reached a couple of hundred kilometers above the surface according to Roth et al, but did not have enough energy to escape into to the magnetosphere, Shemansky added. More observations will be needed to confirm what happened during the plume's eruption, but Shemansky said one theory could have been that a meteorite created a fissure in the surface that subsequently healed. There could, however, be more evidence lurking in archival data. Because there is so much data flowing from each mission, and inadequate resources to analyze it, often information is archived without the chance to look at it. It took Shemansky's team nearly 15 years to look back at Europa's plasma environment based on the Cassini flyby, and he said there are reams of data available from Cassini's orbits around Saturn that may not be looked at for years or decades to come, unless more funding appears. 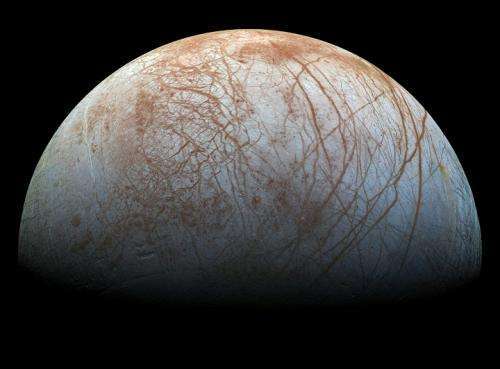 That is interesting data on Europa's plumes, and unfortunate for easy sampling of subglacial material, but the scientist makes too strong claims on how this affect conditions for life. Europa has fresh ice surfaces, including evidence of the 2nd example of plate tectonics in the system (with ice as plates). That by itself means material exchange with the subglacial environment. These moon systems are so incredibly fascinating, with materials transferring between moons and the interplay between the host planet and its satellites. Seems like if life were to develop on even one of these moons it would be relatively easy for it to evolve in order to spread to others. We may NOT be the first species in our solar system to visit another celestial body. OBI-WAN: I have a bad feeling about this. QUI-GON: I don't sense anything. QUI-GON: Don't center on your anxiety, Obi-Wan. Keep your concentration here and now where it belongs. Third. Mars has unambiguous signs of tectonics, including archaic alternating magnetic fields that parallel Valles Marineris. Shemansky said one theory could have been that a meteorite created a fissure in the surface that subsequently healed. Why does a meteorite need to create a fissure? The surface is ice and should instantly vaporize. No? If there is not much atmosphere then the ice is in close contact to the cold of space which is much lower than water's freezing point, it can sublime however but, there may also be enough gaseous water to condense upon Europa, it all depends on relative equilibria between various effects. Ice is a better insulator than water but, to vaporise ice takes tremendous energy, a meteorite (likely very cold) impacting Europa would First have to raise the temperature of ice to zero deg C & THEN it has to supply energy to overcome "Latent Heat of Fusion" & that is HUGE ! "Third. Mars has unambiguous signs of tectonics". I think the consensus is that there hasn't been enough evidence to convince of plate tectonics. FWIW, there is yet another paper in LPSC-15 with more signs. Though I expect that it will not swing the consensus. The Europa case is more open. It is a very good observation, and no one has managed to explain the data better as of yet. I'll admit I don't know if a consensus has formed, but such scientists as Planetary Society's observers write positively about the possibility, which they do not on martian evidence. Not necessarily, its a matter of balance of probabilities as I'm sure you know there are immense number of factors. 1. Depends what u mean by "deep". If disturbance runs deep enough, vapour may leak up the impact's ring faults plus any 'collateral' faults woken by the strike.. Indeed Many unknowns, clearly chaotic with immense imponderables.